The first module is not really completely new to players of the base game. It only expands the amount of available tiles, we already know from the base game. Therefore, we are getting new production, transformation and research tiles as well as new objectives. These new elements can be added to the base game to vary the game and make it less predictable. Although I never missed these tiles before, I found them nice to have. Much more interesting to my taste is the introduction a new type of vassal, a wizard. 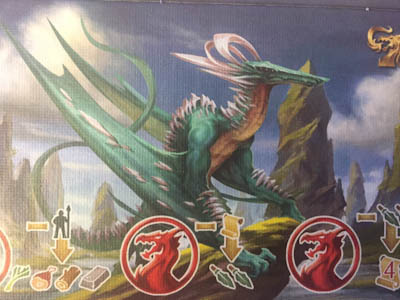 On the one hand, this vassal can be played as a normal dragonrider that only has a single, but mighty free action when it comes into play. On the other hand, it can be used on a completely new board with three different tracks. The wizards can follow these tracks during the game and, as a result, a player can cast minor and major spells. Minor spells are free actions, while major spells cost us a main action. For me this module alone is worth acquiring the expansion. It definitely alters the gameplay most of all the new modules. Leadership is another interesting module, because it breaks the rule that you only may place one Vassal during a turn. 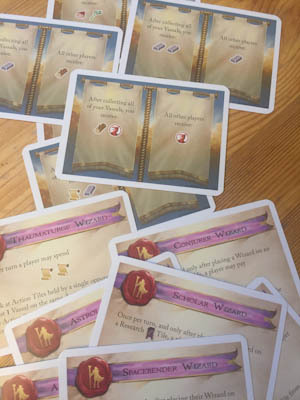 The leadership tiles are shuffled among all other action tiles and by this can be brought into play. 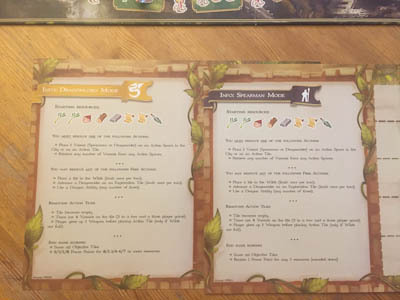 Finally, there are special abilities for each house, so that players do not only distinguish by their dragons, but can also use free or triggered actions by their individual houses. Although these actions do not vary the victory conditions completely, they can be used to follow slightly different strategies, which makes the game even less predictable (if you ever had the feeling, it would be predictable). What the special abilities for each house cannot achieve, the last module can: Quests do influence the victory conditions, as they alter the endgame scorings of a player. 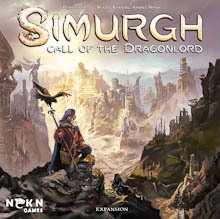 Simurgh – Call of the Dragonlord offers players many options to alter the base game and to find a way to play Simurgh to their individual wishes. 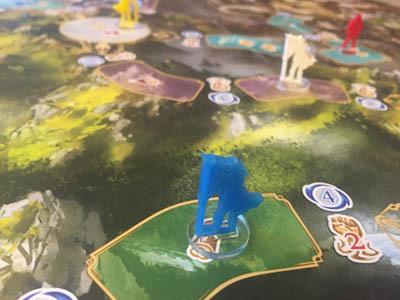 It is especially interesting for players who frequently play the game, as the base game already has a lot to discover for casual players. Apart from the varieties, the wizards are worth to own the expansion anyhow, as this module gives the players some great spells and a new board that wants to be discovered, on the condition that your table is big enough…. I personally liked best that the expansion introduces more interaction and more actions that are aggressive. As said, you can adopt the game to your wishes and no module has to be taken.